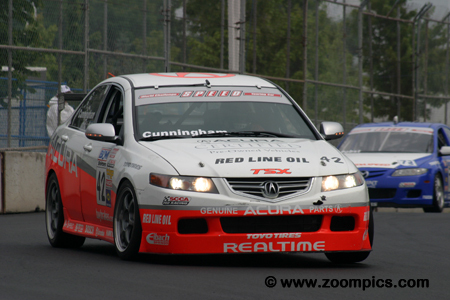 There were twenty entries and nineteen starters for round six of the 2007 World Challenge Touring car race at Toronto’s Exhibition Place. Competitors would be challenged by damp conditions on the eleven-turn 1.755-mile temporary street course. 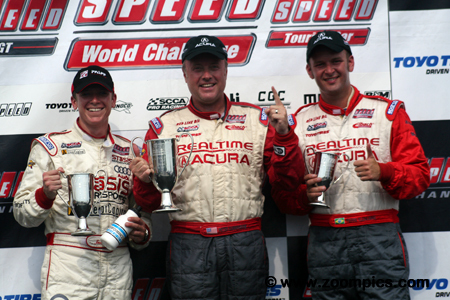 The World Challenge Touring Car podium at Toronto. On the left is second place finisher Ian Baas and the right Pierre Kleinubing, who captured third. Between these two is the winner Peter Cunningham. Cunningham’s victory ended a twenty-five race winless streak which dated back to March 2005 at Sebring. 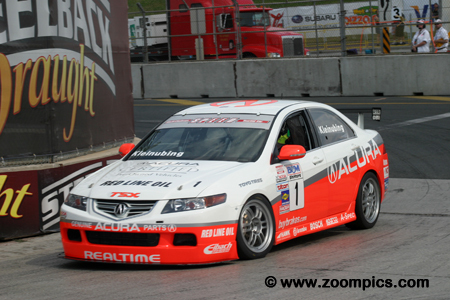 Peter Cunningham qualified his Acura TSX fourth and inherited first when early race leaders Kuno Wittmer and Ian Baas slid off the track and Chip Herr experienced throttles problems. In the late stages of the race, he was caught by his teammate Pierre Kleinubing and Ian Baas. An incident between the teammates allowed Baas to take second from Kleinubing. Cunningham was able to hold off Baas and win by 0.538-seconds. The No. 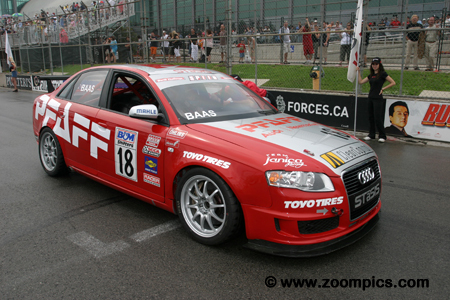 18 Audi A4 was driven by Ian Baas. Baas started second but was the first victim of the wet track when he slid into the corner-three runoff area. This incident dropped him to fifteenth but he made steady progress and by lap-24 he was third behind the RealTime Acuras of Cunningham and Kleinubing. An incident between the teammates allowed Baas to take second. He challenged Cunningham for the lead but finished second. In post qualifying tech Pierre Kleinubing’s front splitter was too low. 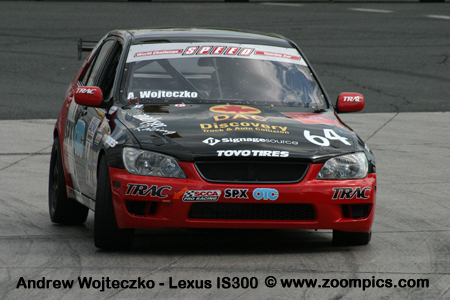 As a result, the defending Touring Car champion was required to start from the eighteenth position. Kleinubing was able to move through the field and found himself second to his teammate, Peter Cunningham. 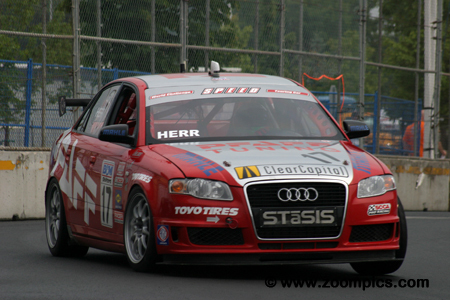 On lap-24, he hit Cunningham which allowed the Audi of Ian Baas to take second. Kleinubing took the checkered flag in third. The No. 73 Mazdaspeed Motorsports Development Mazda 6 was raced by Randy Pobst. In the first five rounds of the 2007 season, Pobst had two wins and four podiums which gave him a comfortable lead in the Drivers’ Championship. At Toronto, he qualified six and finished fourth. Pobst left the event with his points lead intact. 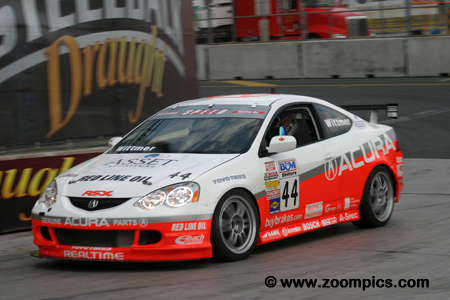 Canadian, Kuno Wittmer, started on the pole in the RealTime Racing Acura RSX. The start of the race was in wet conditions but Wittmer was able to hold off the all-wheel drive STaSIS Audi A4s of Ian Baas and Chip Herr. He led the first four laps until he was caught out by the slick conditions and had to use the runoff area at turn-six. Wittmer returned to the track and was fifth at the checkered flag. Chip Herr drove the No. 17 STaSIS Audi A4. Herr started from the third position and took the lead on lap-5 when Kuno Wittmer was forced to use the runoff area in corner-six. He ran out front for four laps but on lap-10 Herr’s Audi experienced throttle problems which cause him to drop down the running order. He finished three laps behind the leaders in seventeenth place. 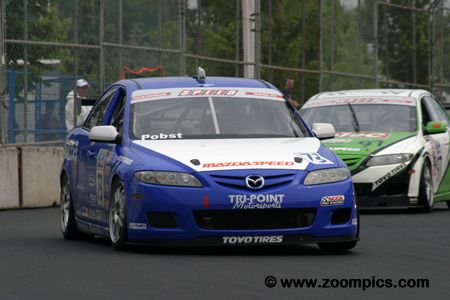 Jeff Altenburg entered the Toronto event second to his teammate, Randy Pobst, in the Drivers’ Championship. The driver of the No. 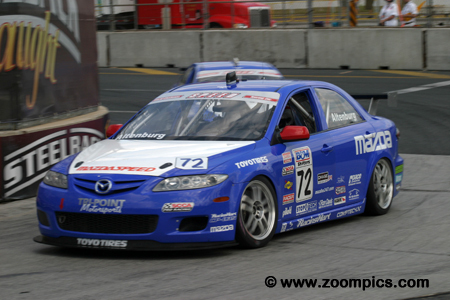 72 Mazdaspeed Motorsports Development Mazda 6 qualified seventh and finished sixth. After the race, Altenburg was still second in points but the gap between him and Pobst had grown. The No. 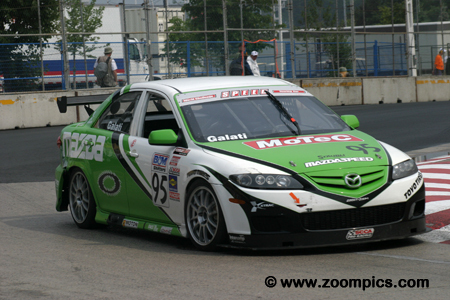 95 Tindol Motorsports Mazda 6 was driven by Charles Espenlaub. Espenlaub’s season was off to a good start. In the first five rounds, his worst finish was an eighth at Miller Motorsports Park and he had earned a podium at Watkins Glen. After qualifying sixth at Toronto, it appeared that Espenlaub’s streak of top-ten finishes would continue but at the checkered flag, he was eighteenth – 7-laps behind the leaders.